World has come to an end. The Mist swallowed nearly the %90 of the population. No one knows exactly what happened. 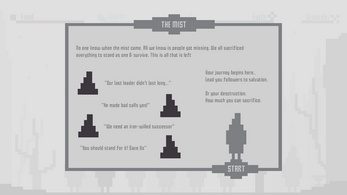 You’re the leader of the last known surviving humans and they have needs that needs your attention to survive. There are 4 resources that you have to manage. If one of them is depleted you basically get exiled from your community. Day is divided into 2 turns. Day & Night. Each turn you can order one of your followers to do one task. 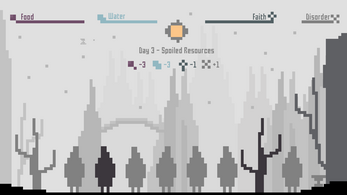 Manage resources and try to survive as long as you can. Food - Keeps your people alive. 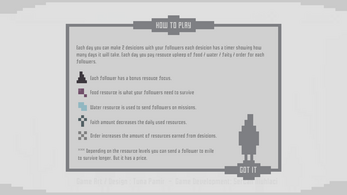 Water - Water is used to send your followers into missions for your community. Faith - Higher Faith allows your followers consume less resources. 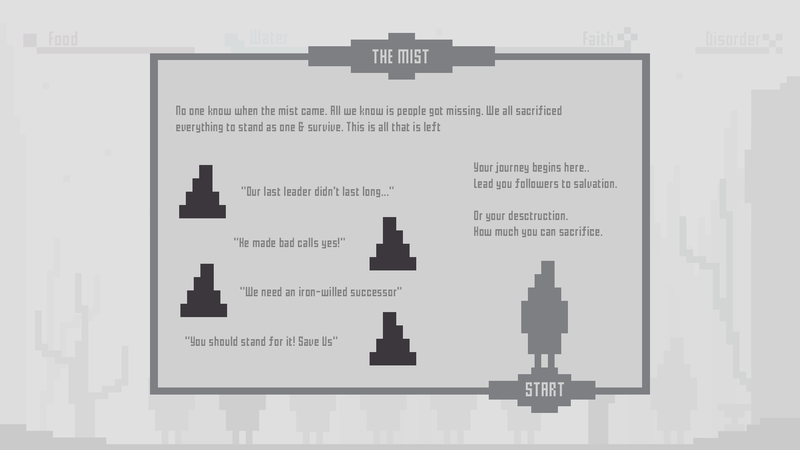 Order - Higher Order allows your followers gather more resources on missions. You can access details of your followers via details tab. Things that we wished to integrate but left for further iterations. 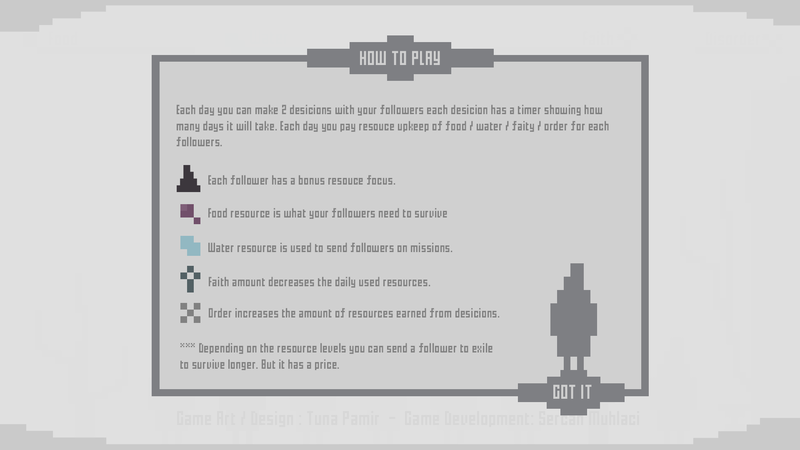 UI Elements that clears out the resource management. Audio does not play on safari. I can't go more than 4 days bc I can't get food! Even if i get a task with a lot of food, it doesn't complete in time! Is there some glitch that when the bars max, they don't go back down? 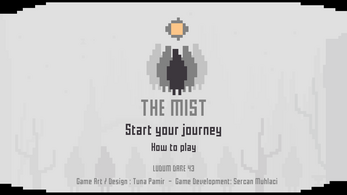 I liked this little game, you really made most of every pixel. The music truly fits and supports the game. I suggest some spell checking. For example, in "Spoils of War", the dialogue states "Remember that suppy crates? Lets go and get them!" instead of "Remember those supply crates? Let's go and get them!" The following points below have some small grammar issues too, which I'll indicate. Some of those dialogue options either A: don't make much sense or B: aren't English expressions. As an example of A, in "Ther is no order!" (There), the dialogue states "We trusted you sire!" The problem is that its name and description appear to indicate a bad event, but in reality, it's an event that gives you 5 Order after 1 day if you say Yea and which you can say Nay just like any other at the same cost of -5 Order. It's also a random event; I've had it trigger several times even with Order above the maximum bar, which doesn't really fit the event's description. As an example of B, in "River Resources", the dialogue states "We can hit 2 stones with one shot! We should go to the riverside?" instead of the English expression "We can hit 2 birds with one stone! Should we go to the riverside?" My last suggestion is to either increase the consumption of resources, decrease how powerful Faith is, decrease the amount of resources given by events or decrease how powerful Order is. Perhaps a combination of those. Or add a harder mode with these and negative events. 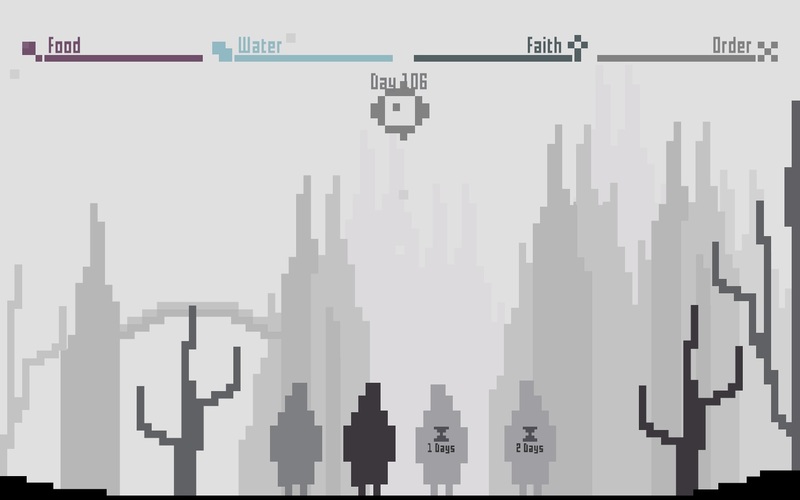 As is, it all just becomes kind of repetitively meaningless after the early game: all your bars are maxed out beyond what you can see, and you just have to keep choosing the long-term events that give you the most to continue increasing the only resource that's left for you to manage: how many days you've played this run. How does this even work? I've failed about 5 times and still have no idea what I'm doing.